Jared Allen (right) leads all defensive ends with 107 straight games played, including all 93 in his time with Minnesota. He has 124 career sacks. Minnesota teammate Kevin Williams has 59 career sacks. EDEN PRAIRIE, Minn. — When Jared Allen arrived in Minnesota in 2008, he was an electric pass rusher coming over in a big pre-draft trade from the Kansas City Chiefs with a league-leading 15.5 sacks. Kevin Williams was the star of the Vikings’ defensive line; already a three-time, first-team All-Pro and one part of the “Williams Wall” with Pat Williams. Kevin Williams was quick to let Allen know his place and how things worked along the Minnesota defensive line. “Kevin was like, ‘You might not have those numbers because I’m coming to steal half your sacks,'” Allen recalled last week. “It was instant competition. But you could tell the way he worked just pushed you, pushed me, to be better; that competition amongst the D-line. Since the unique welcome, Allen and Williams have been united as the leaders of the Vikings’ defense. For 90 games, Allen and Williams have played right next to each other, continuing on the lineage of standout Minnesota defensive linemen. Together they’ve combined for five first-team All-Pro honors as teammates and nine total in their careers. And now, the 33-year-old Williams and 31-year-old Allen might be playing their final games together. Allen and Williams are in the final year of their contracts with the Vikings and a return by one or both is unlikely. “You’re going to make me get sentimental up here,” the usually quiet and stoic Williams said last week when asked about Allen. “It’s been a tremendous honor to have him come in and join forces with me and Pat at the time and now it’s me and him and Brian Robison and Letroy (Guion) and Fred (Evans). We’re a close group of guys. Both Allen and Williams used the term “brother” to describe their relationship. Allen said he and Williams can’t focus on the future right now. The two have a few games left to enjoy playing with each other and add to their legacies. Both will be considered for the Hall of Fame. Allen leads all defensive ends with 107 straight games played, including all 93 in his time with Minnesota. He has 124 career sacks, which ranks 14th all-time and is the second-most by an active player. He has 30 forced fumbles and 17 fumble recoveries in his career, and is also tied for the NFL all-time lead with four safeties. Williams has 59 career sacks playing mostly defensive tackle in his career, to go with eight forced fumbles and 13 fumble recoveries. His five interceptions ties him with Dan Wilkinson for the most among defensive tackles in NFL history. Just as importantly, Williams has missed only five games in his career, and only three to injury. He has taken pride in always being available and ready come Sunday’s for games, saying he’s played through plantar fasciitis and meniscus injuries in his career. He was named the Vikings’ Ed Block Courage Award winner last week for his durability. Allen and Williams continued a legacy that includes four Vikings’ defensive linemen in the Hall of Fame, and two sets of pairs. Carl Eller and Alan Page were the original duo. Later, Chris Doleman and John Randle played together in Minnesota. 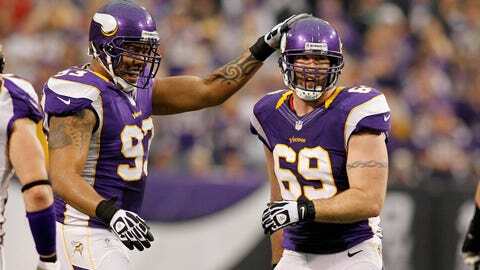 Together, Allen and Williams set the example for the future of the Vikings’ defensive line. The thought of these being his final days in Minnesota leaves Williams appreciating every moment.